Following her passion, Shirley pursued her dreams first to Illinois to earn a Bachelor of Music from Northwestern University, and then back home to New York, to study Voice at the distinguished Manhattan School of Music (MSM). During the day she studied classical music uptown at MSM, but in the evening, she traveled downtown to sing jazz in the clubs. Shirley has performed at festivals, jazz clubs and concert series in New York City and it’s surrounding area. She has appeared at some of Harlem’s best Jazz rooms such as Minton's and Lenox Lounge, where to a sold out audience, she performed music from her inaugural CD Home. She has also appeared at the Metropolitan Room and at the world-famous jazz club Birdland. Once the opening act for the jazz icon Abby Lincoln, Shirley has recorded with the soulful jazz saxophonist, Houston Person and has also performed with the celebrated jazz pianist Harold Mabern and bassist Jamil Nasser, Donald Vega, David Budway, Ron Blake, David Glasser, Brandon Lee, Matt Haviland, Cameron Brown, Jon Burr, Jim West and others. In 2010, she was one of the top 5 finalists at Jazzmobile’s “Best of the Best” Jazz Vocalist Competition held in New York City. In 2009, she was awarded Rockland County’s highest Arts Award: the County Executive Performing Artist Award. Shirley is also the Stanton Bronze Medalist of the 2008 American Traditions Vocal Competition at the Savannah International Music Festival in Georgia. Shirley is a versatile performer and has appeared in various stage productions including Coming to the Mercy Seat at Shetler Studio’s Theater 54 in the role of the Poet and in Ain’t Misbehavin’ at the Elmwood .eater, where she performed the role of Armelia. She is the featured soloist on the jazz CD Africa by The Mystic Pilgrims. 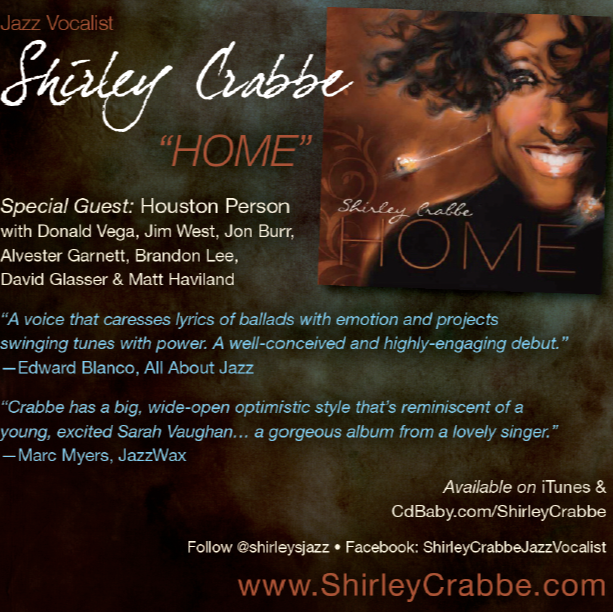 On September 27, 2011 Shirley released her debut CD Home. For the ensuing 26+ weeks (with 6 weeks Chartbound) the album remained on the Jazz Week Album Chart, the definitive jazz national radio chart that reports the top Jazz albums played each week on radio stations across the US. Her latest project BRIDGES, released in April 2018, has remained steady on the charts rising into the top 50. ​Native New Yorker Shirley Crabbe has been hailed as possessing a voice that “must surely appeal to all who love good jazz singing.” Her “almost Ella Fitzgerald–like vibe glows…” says Downbeat Magazine's John Ephland on her debut recording HOME. Released in 2011, HOME features the legendary saxophonist Houston Person. Her latest project BRIDGES (2018) was released to rave reviews and spotlights her collaborations with renowned pianists Donald Vega, and David Budway. Shirley has been a guest on the syndicated radio program “Jazz Inspired” hosted by Judy Carmichael and currently performs at jazz clubs, festivals and concert series in the US. Her awards and notables include the 2009 Rockland County Executive Performing Artist Award, 2008 Stanton Bronze Medalist - American Traditions Vocal Competition. In 2010, she was a top 5 finalist at Jazzmobile’s “Best of the Best” Jazz Vocalist Competition. Shirley holds music degrees from Manhattan School of Music and Northwestern University.